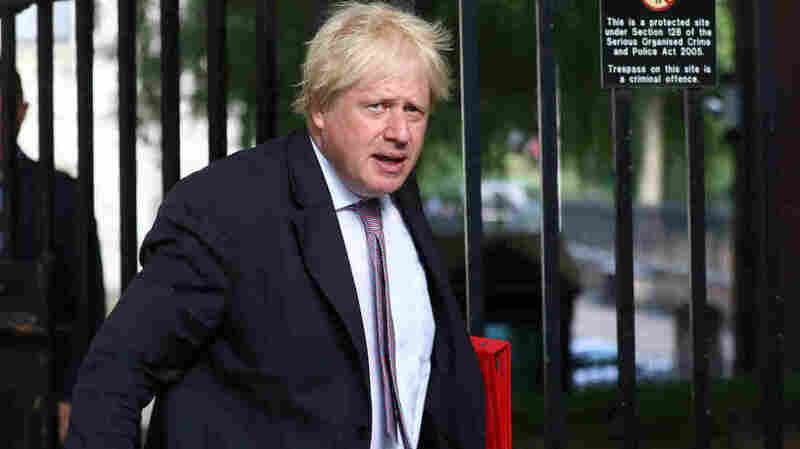 Boris Johnson Resigns From U.K.'s Foreign Secretary Post Over May's Brexit Plan "I have sadly concluded that I must go," Johnson wrote in his resignation letter to Prime Minister Theresa May. He quit hours after Brexit Secretary David Davis also resigned. Boris Johnson told Prime Minister Theresa May on Monday that he was resigning his post as Britain's foreign secretary. He's seen here arriving at 10 Downing St. in London last week. Former health secretary Jeremy Hunt, the longest-serving health secretary in history, according to The Guardian, is the U.K's new foreign secretary, taking over from Boris Johnson who abruptly resigned Monday morning. Former Housing Minister Dominic Raab, has been appointed as the new Brexit Secretary following the resignation of David Davis Sunday night. His promotion within the cabinet is considered an olive branch to die-hard Brexit supports. Big tribute to the hard graft done by @DavidDavisMP and @SteveBakerHW. Looking forward to delivering Brexit with the dedicated @DExEUgov team of Ministers and officials. Unlike Raab, who has always backed the move to leave the European Union, Hunt was not a Brexit believer at the start but has come around in recent months. Johnson resigned from his position as Britain's foreign secretary, soon after the exit of Brexit Secretary David Davis — who said he strongly disagreed with Prime Minister Theresa May's plan for leaving the EU. "I am proud to have served as foreign secretary," Johnson said via Twitter on Monday. "It is with sadness that I step down" — and he then posted an image of his resignation letter to May. "Brexit should be about opportunity and hope," Johnson wrote. "It should be a chance to do things differently, to be more nimble and dynamic" with the U.K. building on its strengths. "That dream is dying, suffocated by needless self-doubt," Johnson added. May accepted Johnson's resignation on Monday, the press office of 10 Downing St. confirmed to NPR. A Downing Street spokesman said, "His replacement will be announced shortly. The Prime Minister thanks Boris for his work." Johnson's abrupt departure comes two years after May took charge. Her tenure has been defined by Britain's grappling with how to withdraw from decades of economic and political alignment with the European Union — the result of a campaign that Johnson and others had backed. As NPR's Scott Neuman reported of the Brexit chief Davis' quitting earlier on Monday, "Davis said the so-called 'soft Brexit' plan, which proposes maintaining a 'UK-EU free-trade area,' would leave the U.K. in 'at best, a weak negotiating position and at worst, an inescapable one.' "
May says that her plan — which emerged on Friday after a Cabinet summit at the prime minister's Chequers country residence — would allow the U.K. to "avoid friction in terms of trade, which protects jobs and livelihoods, as well as meeting our commitments in Northern Ireland." "This is the Brexit that is in our national interest," May told members of the House of Commons on Monday. Briefly addressing Johnson's resignation, May told lawmakers that she wanted to "recognize the passion that the former foreign secretary demonstrated" as he touted Britain's global ambitions. The U.K. is slated to exit the European Union on March 29 of 2019, kicking off an implementation period that will run through the end of 2020. In his resignation letter, Johnson complained that May's Brexit bargaining stance gave away too much. Calling the Chequers deal an "opening bid" in talks with the EU, he said he is worried about the potential for "further concessions on immigration, or that we might end up effectively paying for access to the single market." "We must have collective responsibility," Johnson wrote to May. "Since I cannot in all conscience champion these proposals, I have sadly concluded that I must go." Even before Johnson quit, Labour Party Leader Jeremy Corbyn had said the Cabinet's discord over May's Brexit plan showed she was "incapable of delivering" a workable plan and should step down. With Johnson out, Corbyn sharpened his criticism further. "The Chequers compromise took two years to reach, and just two days to unravel," Corbyn said in the House of Commons. "We have a crisis in government," Corbyn said. He added, "How can anyone have faith in the prime minister getting a good deal with 27 European Union governments, when she can't even broker a deal within her own Cabinet?" Those remarks came during the notoriously boisterous prime minister's "question time" at the House of Commons. At one point, Corbyn seemed to draw a laugh from May herself when he noted that on Friday she had written to her party's ministers "to declare collective Cabinet responsibility is now fully restored." "How's that going?" a minister could be heard adding, amid the peals of laughter. Blaming May for the high-profile resignations, Corbyn said that the ministers who quit had "jumped the sinking ship." Earlier this year, Johnson refused to say he would resign if he was dissatisfied with how May's Cabinet decided to handle key Brexit details. Still, Johnson's exit seems to have caught many by surprise. Before news of his resignation began to circulate, the government's website had touted his announcement of an aid program as part of Johnson's attendance of the Western Balkans Summit, which the U.K.'s Foreign Office is hosting this week.